Best wine in Hermann Missouri! Karen and Charlene are so sweet and funny! Definitely a destination while in Hermann! Their old wine cellar is really cool too! So glad we made that one of our stops! Ended up buying 6 bottles of wine from there! Employees were very nice, I just didn’t prefer most of the wines. Fun place to do a wine tasting. Nice store and friendly service. Neat place with great shopping for food items and decor but we were there for the wine. Did the tasting and the last was very knowledgeable and nice. Wines were very good. I went with the dry wines and don't love too sweet. Good start for a day long wine tour. This is one of our favorite place to visit in Hermann. Hanging out on the patio or inside by the fireplace, talking and enjoying summer sausage, cheese and bread with a bottle of White Lady is a wonderful way to spend the afternoon. Staff is always friendly, no matter how busy it gets. Having a great time doing the Hermann Wine Trail! The wines and hostesses were very nice. Beautiful place too. Allison was wonderful, so sweet and helpful. The gift shop was adorable, and had the most delicious smoked cheeses by the block. Check this one out, cuz I loved it. Highly recommend the Abergele cheese with Mushrooms and chives and the White Lady of Starkenberg wine. Quiet and beautiful place to visit. Had entertainment. Tables set up on the hillside terraces to enjoy the various wines and sights. Delicious wines, savory meats and cheeses, wonderful gifts! A must stop year after year! Nice place, good selection of wines & friendly staff. Wines are a little pricey, especially if you want to drink it there. But do have some very good wines. I love the wine! It was fun to try the different kinds in the tasting. Enjoyed every sip! Staff was very friendly and we enjoyed learning the history! Can’t wait to go back! Great place for family and friends during Oktoberdest. The wine is top notch for this part of Missouri, the music is top notch, and the cheese and cracker selection is phenomenal. I recommend this to anybody coming through Hermann, October or not. Naan bread was really good! The one with brie, apples, Irish cheese and apricot jam! Fun Spot! Good pizza and Rose wine! A must stop! A fantastic winery! Great wine and service. 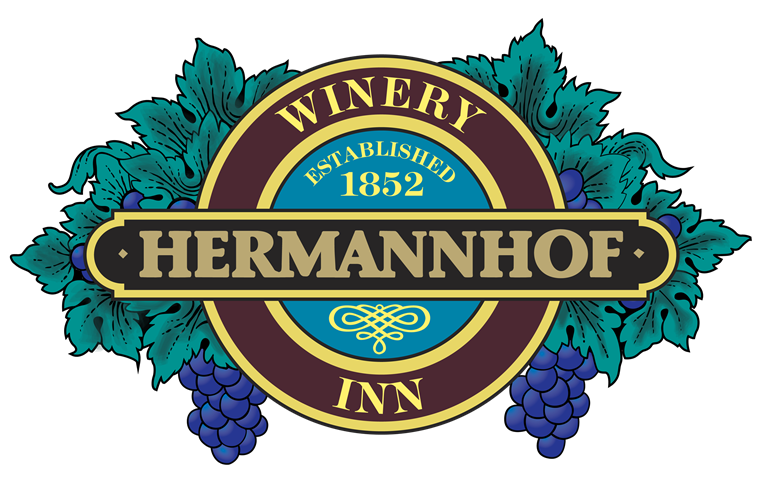 Hermannhoff Winery has a large tasting room with a deli connected next door for enjoying a meal and a bottle (or two) of wine. There is a cellar under the tasting room you are free to explore that was cool. Very friendly staff, very knowledgable. Very fun. I had a great time. View was beautiful and it was so relaxing staying at one of the cottages. Me and my boyfriend loved this place! The staff was awesome! This was the first winery we tried in Hermann and they sure did welcome us and made a great first impression. The wine was delicious! Oh and they have a wine cellar you can hang out in. We can't wait to come back! This is our favorite winery! Everyone is friendly and it’s a beautiful venue year round. I do wish they would bring back the cheese, meat, and bread basket they used it have before they changed their menu. Wonderful little get away. No cell service tho. What a wonderful experience! Staff was kind, friendly and ever ao knowledgable! Will most ceratinky be returning and perhaps even making it a yearly trip! Great wine, great people and great fun!! Thanks for a wonderful afternoon! Great staff, friendly and knowledgeable. Really enjoyed the tasting and the cellar is a must see. Great winery. Friendly service. Lots of places to sit and enjoy great weather and great wine. And a huge deli. We will be back! Very friendly, enjoyed the wine tasting and aampled sausage and cheese. Wish they had a guided tour that told about everything and their history. Fantastic place. Great wine. Perfect atmosphere to enjoy a quiet day with someone you love. Charlene provided us with a lovely thorough tasting, and was extremely knowledgeable on not only the flavors, but the process and vineyards themselves. As a bonus, she had plenty of helpful recommendations for places in town! We enjoyed the wine, the fireplace (it is 16 degrees here in December), and the sample of mulled wine. They have a nice variety of cheeses to pair with wine. I especially enjoyed venturing into the cellar. It was a unique chance to see and learn about the history of Hermann. The gift shop, however, is ridiculously over-priced. Such a great winery! The California tasting room was awesome! Charlene is amazing and really went the extra mile while we visited Hermannhof! The best part was meeting Paul, the winemaker! Love Hermanoff, it is a great place to sit, relax and have some great wine and snacks. Great wine tasting, don’t be scared to try the wines that are not as commercialized!! Great tastes from dry to sweets!! Great place and great wine! Loved it! Loved the people and the town very friendly! Great place with wine and friends!! Be sure to check out the live music at night! We were there today. Julie made our wine tasting experience fun! She is very knowledgeable and friendly. We love this place and it's our favorite stop each visit. Loved the self tour. Nice shopping selection. Nice people. Loved the to go lunch and oh yea! Some really good wines! Excellent wines with knowledgeable and friendly hosts. Always a fun time to go and try new wines. Great Wine, staff and venue. đˇ Summer music weekends are my favorite, I always hate to see them end. Visited all the wineries in Hermann and this was the best tasting experience. Employees are very knowledgeable and friendly. The Rose and the Chambourcin were my favorites! Wine was good and reasonably priced, service was good, and the sausage and cheese was wonderful ! We had a great experience here! It was the first winery of our trip. They had friendly staff, a beautiful outdoor seating area, and absolutely DELICIOUS wine. We enjoyed our time there so much that we had to swing back by before we got on the train to come home to buy a few more bottles!